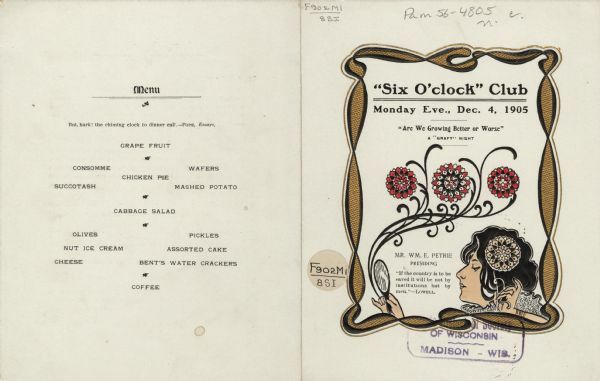 Front and back covers of the menu and program for a Six O'Clock Club dinner, with an Art Nouveau style border in black-edged textured gold and the profile of a woman's head. Her hands are visible above the bottom of the frame; one hand holds a flower which is highlighted against her black hair; the other holds a hand mirror and a spray of three red flowers with sinuous stems. The graphic elements are embossed. The Six O'Clock Club was a men's social and dining club, centered on topics of political and civic interest. For other Six O'Clock Club menus, see Image IDs: 102830, 103636, 103640, 103782, 103784, 103797, 103798, 103802, and 103805.